WASHINGTON, DC, August 30, 2015 (ENS) – Forty-two airlines have announced or reaffirmed bans on wildlife trophy shipments since the killing of Cecil the Lion by an American dentist in Zimbabwe last month. Virgin, Delta, British Airways, Iberia, Aer Lingus, Air Canada and Jet Blue are among the carriers that have banned shipping wildlife trophies. Following Cecil’s death, Humane Society International contacted all of the world’s 250 airlines requesting that they immediately stop the shipment of trophies of the African Big Five species – lion, leopard, elephant, rhinoceros and Cape buffalo. HSI confirms that 42 airlines now prohibit shipment of trophies from the African Big Five and other wildlife. South African Airways and shipping giants UPS and FedEx have yet to implement bans. “We urge all airlines to follow their lead and help save animals like Cecil the Lion, brutally killed at the hands of a wealthy American hunter,” he said. Wildlife-based ecotourism brought an estimated $34.2 billion in tourist receipts in 2013, according to a report by the World Tourism Organization. Meanwhile a study of nine countries that offer trophy hunting found that, in 2011, tourism contributed, on average, 2.4 percent of Gross Domestic Product, but trophy hunting contributed only 0.09 percent of GDP. Trophy hunting threatens the survival of many species, including lions. Wild lion populations have declined by 50 percent in the past 30 years due to a myriad of threats, including trophy hunting. Fewer than 40,000 African lions are estimated to remain in the wild today. Meanwhile, Cecil’s killer, Walter James Palmer of Eden Prairie, Minnesota has reopened his office, River Bluff Dental in Bloomington, which was closed for several weeks during the international uproar over the lion’s death. On July 6, Walter James Palmer was taken to Zimbabwe’s Hwange National Park by a professional hunter. They went hunting at night, and with a light they spotted Cecil. They tied a dead animal to their vehicle to lure Cecil out of the park. Palmer shot Cecil with a bow and arrow, but this shot failed to kill him. They tracked the lion down and found him 40 hours later, when they shot him with a gun. 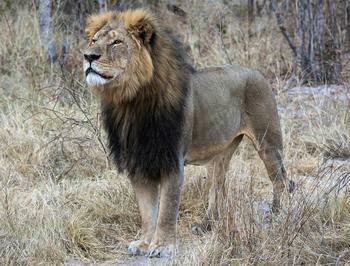 A popular tourist attraction, Cecil carried a GPS collar because he was being studied by Hwange Lion Research, funded by Oxford University. The Zimbabwe Conservation Task Force says the hunters tried to destroy the collar but it was later found. Cecil was skinned and beheaded for a trophy. Palmer has stated that he had all necessary permits for the hunt and believed he was acting legally. Zimbabwe has requested that the United States extradite Palmer to face a court in Cecil’s home country.